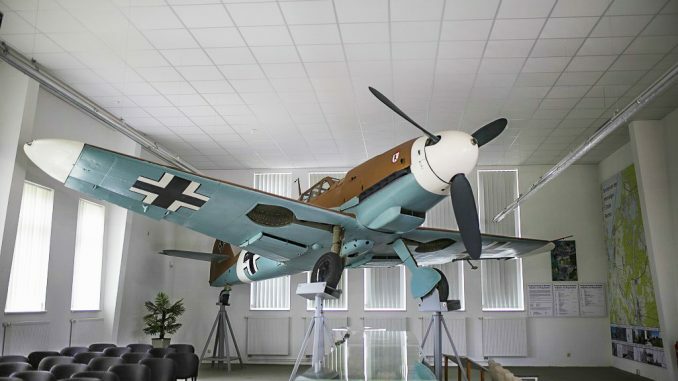 The Luftfahrt Technisches Museum (Aviation Technical Museum) in Rechlin, Germany unveiled a ‘Messerschmitt Bf 109’ in a new display during late March. As many readers will know, Rechlin was the Luftwaffe’s primary flight testing facility prior to and during WWII, and the ‘109 was one of the most important types tested here. This ‘Messerschmitt Bf 109’ is actually based upon a Spanish-built Hispano C.4J ‘Buchon’ of uncertain identity, and has been in Germany since the 1960s. 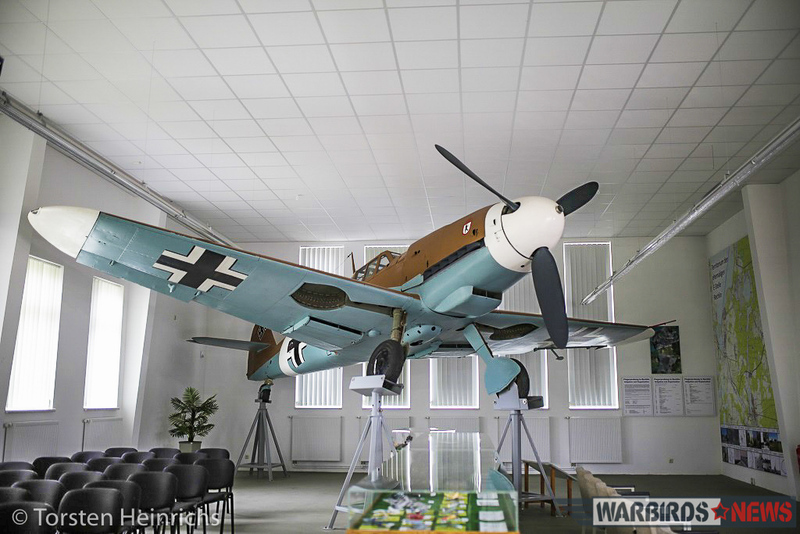 The aircraft has been a part of the Military History Museum at Berlin-Gatow for many years, and is now on loan to the museum in Rechlin. It moved to the new location in February on long-term loan. March was especially busy for the museum staff in Rechlin. 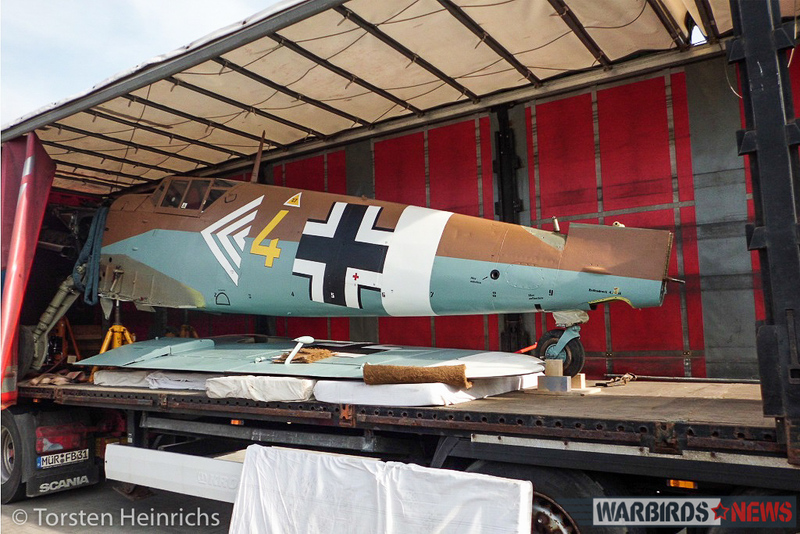 The head of collections for the Military History Museum attended the Messerschmitt Bf 109’s official unveiling in Rechlin. In discussions with the museum director, Lieutenant Colonel Leonhardt stressed the good cooperation between the two institutions. He also praised the efforts of the Luftfahrt Technisches Museum and the local community in the rehabilitation and expansion of the area of ​​the former Luftwaffe test site. He particularly singled out the thematic orientation and appreciation of the people involved. The new exhibit came to Rechlin in a disassembled state aboard a truck. A group of volunteers spent several days reassembling the Spanish-built fighter and lifted her onto the specially-made stand. The fighter now “flies” at a five foot altitude above the heads of museum visitors in the facility’s conference room. The 109 will make an impressive backdrop during museum events. This ‘Bf 109’ is a license-built version of the Bf 109 G2 manufactured by Hispano Aviación S.A. (CASA). Built in 1950, the fighter flew with the Spanish Air Force until 1968. After her retirement, the Spanish donated her back to Germany. She first appeared at the 50th Richthofen Jagdgeschwader reunion of JG 71 “Richthofen”, painted in the colors of the group commander of Jagdgeschwader 2. Later, the aircraft moved to the Air Force Museum at Uetersen. Here, in the early 1990s, the fighter received an engine conversion from the Buchon’s Rolls-Royce Merlin to the more appropriate Daimler-Benz DB 605 complete with new cowlings to give her the looks of a Bf 109 G2. In November 1995, with the relocation of the Air Force Museum to Gatow, the ‘109 received a new paint scheme. She is marked in tropical camouflage with the triple angle and yellow 4 for the group commander Major Gustav Rödel of II./JG 27 which he flew in North Africa and Italy in 1943. WarbirdsNews wishes to thank Philipp Prinzing / Motor Presse Stuttgart for his article and to Torsten Heinrichs for his photographs!